Out team is a fan of the Kyosho Mini-Z small scale RC model cars and since they are our hobby like 3D printing is we’ve decided to combine the two, so we started making some parts for the Mini-Z remote controlled model cars to be 3D printer. Some of our designs are already available on Thingiverse for free everyone to try printing and using them and if you do you are welcome to share your feedback. 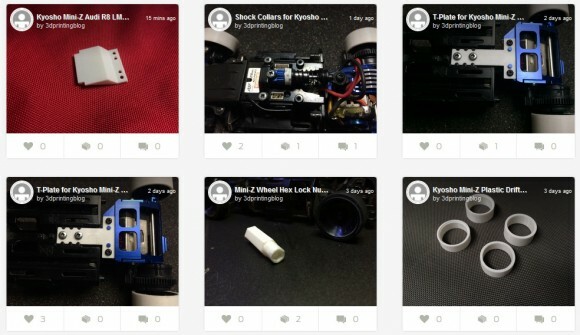 We have also started a group called Kyosho Mini-Z for people that love 3D printing and Mini-Z RC cars, so you are welcome to check it out and join the group. Our Mini-Z 3D designs will be included in the group, so that can be an easy way to keep track of new things and communicate with other interested users as well. We are currently working on some more designs covering the Kyosho Mini-Z MR-02 and MR-03 rear wheel drive models as well as the MA-010/MA-020 AWD models, so stay tuned for more.